The Waterfront Regeneration Trust, a charity dedicated to the completion, maintenance and promotion of the Ontario Canada Waterfront Trail, today unveiled a 620 km expansion of the signed route across Lake Erie. 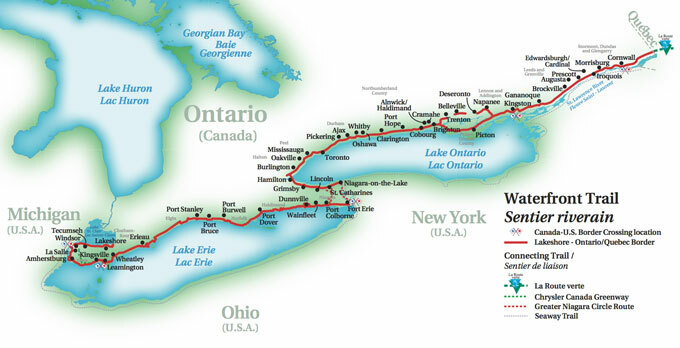 The existing 780 km signed route that provides a marked path along the waterfront from the Quebec border to Niagara-on-the-Lake, will now run to Lakeshore Township just outside of Windsor. The announcement was made at the Windsor trailhead of the Great Waterfront Trail Adventure, an annual seven day end-to-end fully supported cycling tour that attracts Ontario families and tourists from all over North America to explore Ontario’s Great Lakes waterfront. The Adventure takes participants from end-to-end of the route’s Lake Erie portion, stopping in local communities to explore, shop and sightsee. Participants range from 13 to 74 years of age cycle an average of 60 to 100 km a day. The Canadian Automobile Association is also doing their part to make it easier for people to explore Ontario’s waterfront. The Association is launching a new CAA Ontario Bike Assist app to help tourists and residents explore the Trail. It is currently available for Android users (coming soon to the iTunes store) and features routes and trails that have been deemed scenic and approved as safe to travel by CAA’s own Mapping and Research Specialists. This is welcome news for James Burque, a cyclist from California, who has the goal of cycling all the Great Lakes. He represents the growing group of tourists who are exploring the continent on two wheels, presenting a huge economic development opportunity for communities situated on a path like the Waterfront Trail. The Trail isn’t just a draw for cycling enthusiasts, also participating in the Adventure are families. Honourary Tour Director and Essex Town Councillor John Scott, will ride the 620 km route on a tandem bike with his son and sees a huge potential for families to take advantage of the Trail for holiday excursions. As a travel writer, once in a while I get invited to attend various travel-related events. When an invitation was extended to me to take part in one of the soon-to-be-introduced Bruce Trail Waterfall Walks (August 2013), I thought it would be just like any other hike. Boy, was I wrong. Yes, it was a hike, but much more. Maria Fortunato, executive director of the Hamilton Halton Brant Regional Tourism Association (www.theheartofontario.com), explained, “This walk has been a year in the making. It’s a type of packaged walking tour that’s never been done in Ontario. It’s most unique”. 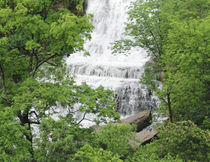 There are two tours offered, all-inclusive two-day and five-day waterfall walking holidays that wind along the Bruce Trail atop the Niagara Escarpment in the Hamilton-Halton area. Groups consist of anywhere from 12 to 20.Participants stay over night in top-notch hotels with scrumptious meals. No beans and wieners here. I decided to put on my best walking shoes and try out this new adventure. From the moment I stepped onto the trail on the rocky collar of the Niagara Escarpment (a UNESCO World Biosphere Reserve) near the edge of Hamilton, I knew it was going to be interesting. What was unique about this hike was that I observed my surroundings in a different way. It was because I was accompanied by a knowledgeable guide, Beth (Kummling) Gilhespy, executive director of the Bruce Trail Conservancy (www.brucetrail.org or 1-800-665-4453). She was a walking encyclopedia about the geology along the trail. The morning walk took us through a Carolinian forest, past numerous waterfalls (there are 28 waterfalls along the Niagara Escarpment) and scenic lookouts that left me in awe. Things you might see along the trail are paw paw, flowering dogwood and sweet chestnut. If you’re lucky (I wasn’t), you might get a glimpse of a southern flying squirrel or wooded warbler. This hike would be perfect for birders to add more names to their list of birds they’ve spotted. After a full morning of walking 10 kilometres, we took a lunch break at the Ancaster Mill Restaurant. This landmark Ancaster dining establishment is a beautifully restored 19th-century grist mill. The nature theme continued with our Earth to Table cuisine. We lingered after lunch to absorb the lovely waterfall outside our dining room table. After another afternoon of hiking (we were all wiped, but with that type of tiredness that you feel good about), we were shuttled to the Best Western Luxury C Hotel on Stone Church Rd. above the escarpment, which was home for the night. Home was never like this. After a real good shower, I rested for a few hours and then headed downstairs for another delicious meal, where we reminisced about our day of adventure. Sleep that night was easy. I have to make a confession at this point. Due to other plans I had that day, I didn’t continue the hike. A few days later I spoke with a few of my fellow hikers who said they were now hooked on hiking and plan to do it again. The Bruce Trail starts (or ends, depending on where you are) at Queenston Heights and winds its way along the Niagara Escarpment through the Niagara region before heading towards the Bruce Peninsula at Tobermory. It is Canada’s oldest and longest footpath, over 880 km beginning to end. 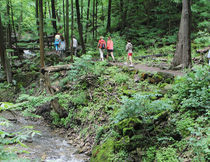 The Bruce Trail is funded almost entirely by individuals, organizations, foundations and corporations. Less than 1% is contributed by any level of government. Isn’t that refreshing? Keep in mind this tour includes a highly knowledgeable trail guide, accommodations in first-rate hotels, breakfast, lunch and dinner each day and ground transportation between your hotels and restaurants. Also included are a one-year Bruce Trail Conservancy membership and an official Bruce Trail guidebook. A two-day hike of 25 km where you view 19 waterfalls is $588 (+tax) per person, double occupancy. Single occupancy is $794. A five-day hike of 45 km where you view 28 waterfalls is $1,198 (+ tax) per person, double occupancy. Single occupancy is $1,499. To read about an adventure thru-hiking the entire Bruce Trail pick up a copy of Bruce Trail – An Adventure Along the Niagara Escarpment. Montreal to NYC Multi-use Trail / Bike Path – Why Not? Gov. Cuomo called for an “energy highway” between Montreal and NYC/downstate in his address last week. Now the Regional Plan Association has called for expanding the idea to include higher speed rail and broadband service in a multi-use corridor (see http://www.rpa.org/2012/01/an-energy-rail-broadband-expressway-to-quebec.html). Good idea. Now we should propose including a multi-use trail/bike path in the corridor, also. Pieces of such a trail already exist, the cost would be small compared to the other elements, and, given the popularity of bicycle tourism, the economic benefits could be large. For information on bicycle tourism, refer to Parks & Trails New York’s Bicyclists Bring Business at http://www.ptny.org/pdfs/canalway_trail/b3/Bicyclists_bring_business.pdf. This clip is great for animal lovers and young children — Momma Bear and her three very young cubs in the wild of northern Ontario , Canada. Humane wildlife experts taking a winter bear census right in the hibernation dens. You’ll love this, besides the cute precious 6 week old baby bears (eyes still closed) the guy (Rick Mercer) has some of the funniest lines. Click here for a special video of retagging a mommy bear. Checking out the fall foliage is a great way to spend the weekend, but if sitting in a car and staring out the window leaves you pining for a little more action, here’s an alternative. Holiday Valley, a ski resort popular with Canadians an hour south of Buffalo, has recently completed a couple of adventure attractions that has turned leaf peeping into a contact sport. The Sky High Adventure Park features eight enormous tree-top courses of varying difficulty — yellow, green, blue and, if you dare, two double blacks that soar to 60 feet, Black Storm and (gulp) Commando — where visitors navigate an assortment of wildly unstable rope bridges, obstacles and zip lines. “You’ll be able to recognize the zip lines,” said our kindly instructor, “because there won’t be anything to put your foot on.” A point worth remembering when you’re standing on a small platform high in a tree. From this vantage point, nature’s annual show is not only in colour but also hi-def. Participants ($42 for three hours) wear harnesses with a special locking lanyard that prevents a fall of more than a couple of feet. Tethered to a cable or not, it takes a certain leap of faith to step off a platform onto a free-swinging block of wood with only a piece of rope to hang onto. Strategy, more than strength, is the key to completing the aerial park courses, which is why a couple of beefy twentysomethings, who’d been pretty boisterous during the orientation talk, needed to be rescued by staff from a double black. A couple of young women in their group who’d completed a blue course really enjoyed that. Sky High will remain open on weekends through the resort’s Fall Festival Oct. 7-10. In August, the resort’s Mountain Coaster began operation. The ride is similar to a roller coaster with two-man cars on rails that first travel up the ski hill before turning around and zooming down a 760-metre course through the woods. Riders can control their speed using handles on the sides of the cars. The Mountain Coaster ($6) also operates on weekends through Oct. 10 and will run during the ski season. Holiday Valley includes a well-maintained 18-hole golf course, Double Black Diamond ($22-59), that offers some spectacular views of the resort’s tree-covered hillsides from an array of elevated tees. Mountain bike and hiking trails that weave through the ski area are another fine way to experience the autumn show. And unlike some of the more popular colour destinations in New England, you’re likely to encounter more deer than fellow hikers on the trails of Holiday Valley. Roasting S’mores by the fire pit next to the swimming pools is a wonderful way to finish the day for kids of all ages. The John Harvard Brew House is only steps away, just in case you need something to wash down the graham crackers. WHEN TO GO The best time for colours in Ellicottville are the first two weeks of October. ARRIVING Cross border at Peace Bridge and take 190 South to Interstate 90 West. Take Exit 55 to Rt. 219 South for 80 kilometres to Ellicottville, 247 kilometres from Toronto. Estimated fuel cost for mid-size car: $50. SLEEPING Holiday Valley offers a number of packages that incorporate golf, pampering at the serene Falling Waters Spa, the Sky High Adventure Park and the Mountain Coaster. Accommodation ranges from the four-star Tamarack Club condo/hotel with spa and heated pool to the Inn at Holiday Valley to a wide range of comfortable family-style condos within the resort or in the village of Ellicottville. In town, the spotless Kelly House Lodge ($70) is hard to beat for families on a budget. The favourable exchange rate is a bonus for Canucks. DINING AND DRINKING The John Harvard Brew House offers a nice range of craft beers and good pub grub. In town, the Gin Mill on Washington St. is the liveliest spot, with loads of atmosphere and terrific burgers. The Buffalo and Fort Erie Public Bridge Authority (Peace Bridge Authority) once again reminds local residents of the “Bike to the Bridge” campaign, which encourages non-vehicular border crossings and seeks to educate bicyclists and pedestrians on proper crossing procedures at the Peace Bridge facility. Such efforts include a combination of improved public outreach and information distribution, as well as continued promotion of current Western Hemisphere Travel Initiative (WHTI) document identification requirements. A suite of promotional materials supporting the “Bike to the Bridge” campaign are available at www.peacebridge.com/biketothebridge. Such items include an instructional video on “how to cross” the bridge by bicycle, downloadable maps and pamphlets with travel routes, a complete listing of necessary identification requirements, as well as reference links for respective Canadian and American Customs agencies. Walk the bridge information can be found here. The Authority’s commitment to engaging and educating the Southern Ontario and Western New York bicycling communities through the “Bike to the Bridge” effort was selected this past year by The League of American Bicyclists to receive an official support citation. For more information on the Peace Bridge Authority, visit www.peacebridge.com. The Buffalo and Fort Erie Public Bridge Authority, a binational authority, has owned and operated the Peace Bridge since 1933. The bridge, which was opened to traffic in 1927, spans the Niagara River between Fort Erie, Ontario, and Buffalo, New York, and is a key international border crossing. The Authority is governed by a 10 member board with an equal number of representatives from Canada and the United States. As an international compact and in accordance with its enabling legislation, the chairmanship alternates annually between Canada and the United States.